If it wasn’t immediately obvious to you, Intel thinks the future of the systems business is weaving interconnection fabrics onto server processors – thus consolidating yet another component of the data center onto the processor and bringing to bear Chipzilla’s wafer etching process advantages on that unified chip. And, if Intel plays its cards right, giving it a sustainable advantage to keep arch-nemesis Advanced Micro Devices and up-and-coming rivals in the ARM collective. The problem, of course, is that many applications are so big that they cannot be solved in a shared memory system that gangs up multiple processors together in an SMP or NUMA cluster. SMP and NUMA systems pretty much run out of gas after 32 sockets, and there is not much more you can do about it beyond cramming more cores into a socket. Shared memory systems make programming easier because coders don’t have to deal with parallelism themselves – it is done by the processor, the chipset, and the memory controllers that make a moderately parallel machine look more monolithic. If you want to scale further than SMP or NUMA, you need something that looks more like a modern supercomputer interconnect and the related programming and scheduling tools that are tuned for it. Everybody in the server chip racket knows they need some sort of fabric interconnect because it is, in effect, the new chipset for scalable computing. And a fabric is more than just a network, which can allow anything to talk to anything. Fabrics are tuned for specific workloads and are designed to deliver predictable performance without jitter and other side effects. Silicon Graphics and Cray have their own respective NUMALink and XE interconnects. The latest UV2 shared memory supers from SGI use the NUMALink 6, a substantially improved and more compact design than prior NUMAlink interconnect fabrics and notable because they implement shared memory across a maximum of 512 Xeon E5-4600 nodes. Advanced Micro Devices snapped up SeaMicro for $334m in March to get its hands on the “Freedom” 3D mesh/torus interconnect that bears some resemblance to the BlueGene family of interconnects. At the other end of the spectrum, the ARM server processors just shipping or in development from Calxeda, Applied Micro, and Marvell all have on-chip networking of various kinds. These vendors are actually blazing the trail by adding switches or routers to compute devices. Intel can’t let the ARM collective take the lead here, and it has also made no secret that it wants a big piece of the exascale supercomputing market. It has done a number of key, strategic acquisitions to put a very serious stake in the ground. And as we all know, ideas that start in HPC systems often make their way into commercial systems down the road. In this case, fabric interconnects may end up in regular systems a little sooner than many expect – particularly considering the parallel nature of many database, data warehousing, big data systems, and web caching these days. Both Gemini and Aries are based on a high radix router design, with Gemini being a dumbed down version of Aries that is meant to plug into the HyperTransport links of Opteron processors. Aries will plug into PCI-Express 3.0 ports and therefore not be tied to any specific processor. (Well, we’ll see about that, with Intel owning Aries now.) Gemini was designed to scale to 1 million cores in a single system (not with a shared memory architecture, but just as a high-speed cluster), and Aries will no doubt scale further than that and may even have shared memory features for modestly sized clusters with a few thousand cores. With its own Ethernet, InfiniBand, and Cray interconnects and lots of people who know about system I/O and server-side networking, Intel has a formidable set of assets from which it can build fabric interconnects and gradually move them onto the Xeon and Atom dies to make very scalable clusters of compact and efficient server nodes. But don’t think Intel is going for a one-size-fits-all approach. 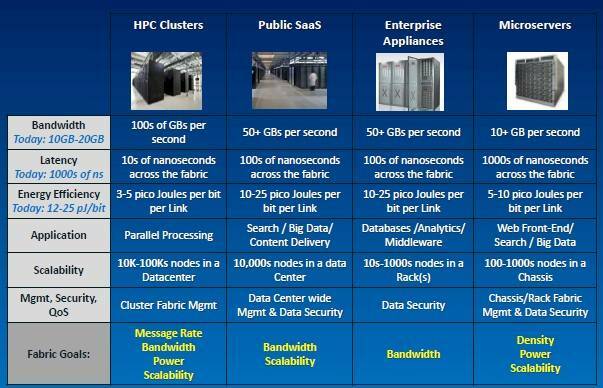 “The fabric requirements for each segment of the market are not the same, and their bandwidth and latency needs are not growing at the same rates,” said Hazra. Intel wants to rule system interconnect fabrics like it does server processors and increasingly does with storage array processing – and it will also have to rule main and flash memories for systems, too, since these will be integral parts of future exascale computing systems and their commercialized offshoots. The first step was to get the intellectual property and foundation for various fabrics. The next step will be to integrate fabrics onto server processors and coprocessors like the Xeon Phi x86 compute coprocessor that will come to market early next year. Hazra wouldn’t give out a lot of details about precisely how Intel will integrate fabrics into chips. But there are clearly three options. Intel can move a fabric controller onto the system motherboard beside the CPU socket, as Cray, SGI, Fujitsu, IBM, and AMD/SeaMicro do with their respective interconnects. It can move the interconnect controller into the processor package but have it be a distinct chip from the processor, as was done with early hybrid CPU-GPU processors for laptops. Or Intel can use the transistor budget and process shrink to put the fabric controller right on the CPU die, much as it has moved on main memory controllers and now PCI-Express 3.0 peripheral controllers with the Xeon E3 and E5 server processors. We haven’t worked through all the details yet, and we certainly have not announced if fabric integration onto the chip will happen in one step or two steps,” Hazra tells El Reg. 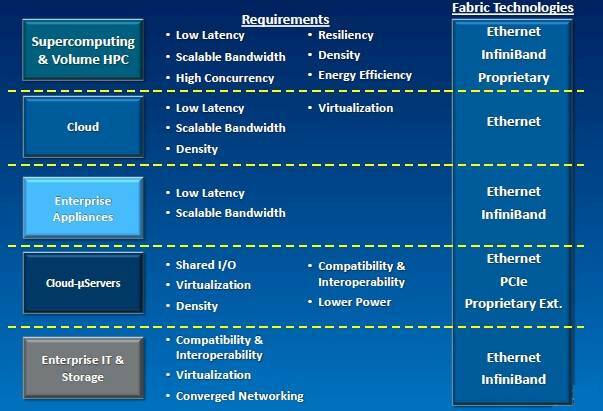 The packaging and chip processes available in volume at the time that Intel hopes to get fabric integrated with Xeon, Xeon Phi, and server variants of Atom processors will ultimately determine what Intel does. “Be prepared to be surprised,” Hazra says with a laugh. That is a pretty powerful hint, and it brings to mind the switch-hitting SwitchX ASICs that Mellanox Technologies has cooked up, which are at the heart of its own Ethernet and InfiniBand switches and can speak either protocol. Cray already has a software stack that makes the Gemini interconnect look like Ethernet to a Linux operating system, and Intel could go so far as to create an Aries derivative that could function like an Ethernet, InfiniBand, or Aries controller in a server cluster. Or, if that is too ambitious, Intel could do an Aries integration for high-end supers and a converged Ethernet/InfiniBand controller for more generic servers. Oddly enough, a trimmed down Aries interconnect that spoke Ethernet and could scale to hundreds of thousands of Atom cores is probably what web infrastructure companies might want. And could take on AMD’s newly acquired Freedom interconnect.